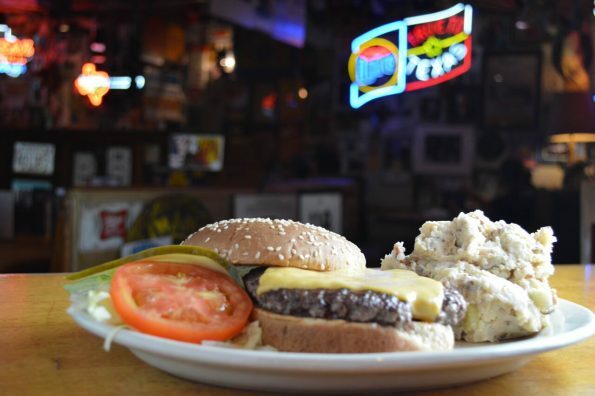 Local grandmas and grandpas, plus fans of big beefy cheeseburgers looking to celebrate either National Grandparents Day or National Cheeseburger Day at TEXAZ Grill! Treat your Grandparents to a hearty meal just like they used to make, with National Grandparents Day at TEXAZ Grill in Phoenix, where all day long on Sunday, September 11, 2016 (10 am to 10pm) they will be serving up classic, rib-sticking Chicken & Dumplings for only $8. Brimming with from-scratch dumplings and hearty chunks of chicken, this creamy, filling stew is the same recipe that TEXAZ’s Owner/Head Chef, Steve Freidkin learned from his mother back in Texas. Plus, all grandparents will receive complimentary Rice Pudding with an entrée order. Then exactly one week later, treat yourself to a TEXAZ Grill’s famed cheeseburger for only $6 in honor of National Cheeseburger Day. Offered during Sunday Brunch on September 18 (10 am to 4 pm), savor a six-ounce, hand-formed beef patty cooked to order on a sesame seed burger bun with your choice of cheese, plus tomato, onion, pickle and lettuce on the side, served with TEXAZ fries. For more than 30 years Steve Freidkin, owner, chief cook and bottle washer at TEXAZ Grill, has been cooking up Chicken Fried Steak after Chicken Fried Steak, with more than 900,233 steaks having been served to date… and counting. TEXAZ Grill’s unique setting is a tribute to the things that Texas devotees love about the Lone Star State.The award-winning restaurant has been recognized locally as the Best Local Treasure, Best American Restaurant, and Best Affordable Steak Dinner, and nationally for Tops for Value.